HVAC marketing is a special animal. You need it to support your business all year long, but as the seasons change, you must constantly reconfigure your strategies to ensure that you’re maximizing the outreach to your existing and future customers. Retain Relationships. Before you know it, your newest happy customers will be gone when the seasons change if you’re not careful. HVAC professionals have a habit of leaving one job well done and moving on to the next. While it’s true that your ultimate goal is to create happy clients, it’s important to remember that your job is never truly done. Your customers are homeowners, and homes require a lot of work. Stay at the top of your customers’ minds with regular follow-ups that include useful, relevant information that will remind them of your services when it’s time for them to schedule their next appointment. Co-Op & Cross-Sell. Cross-selling can be a game changer for successful HVAC companies. The key is to find ways to remind your customers how much you could do for them without being so forceful that you scare them away. If you have the ability to join a co-op, you may realize great rewards by joining forces with other like-minded area business leaders. Ready to learn more and get more specific things you can do? 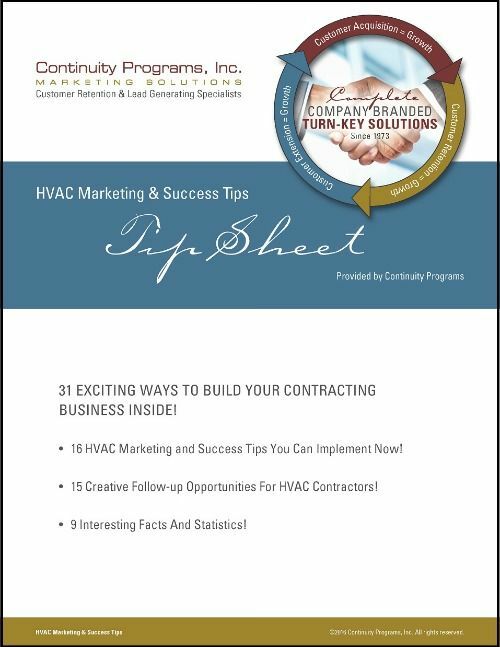 Check out this HVAC Marketing & Success Tip Sheet!